This afternoon, we have a little down time on our pilgrimage. A number of folks have headed out to various walking destinations in Jerusalem. I have opted to spend some quiet time in my ‘cell.’ In part, this is due to feeling a bit puny (a few days ago I forgot my rule to never eat ground meat in a foreign country), but just as much it reflects a need to decompress and find a sense of grounding. But there is one aspect that is simple. That is universal. We all long for a sense of home. Physically. Spiritually. Emotionally. There have been moments on this glorious journey when I find myself longing for home, ready to return to those places and relationships that give me a sense of wholeness and connection. 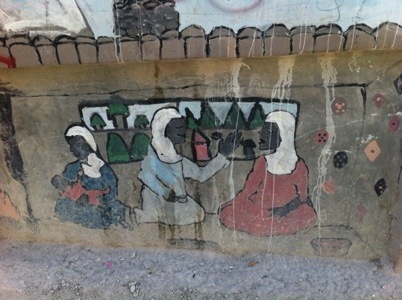 Pictured here is a simple mural. It remembers a place of peace and tranquility, where quality of life is possible for all. In it, one can detect that deep sense of longing we all share. The longing for home. In the coming weeks, with the collaboration of those who feel drawn to this kind of welcoming community, more will be revealed. In the meantime, how does the name “The Way Home” strike you? This entry was posted in Christianity, congregational development, Diocese of Florida, Episcopal church, faith, Ministry, peace, Uncategorized, unity and tagged Christianity, home, homelessness, mercy, new ministry, option for the poor, recovery, simple prayer. Bookmark the permalink. 6 Responses to The way home. Thanks. I am glad you started this blog to share your experiences and thoughts. I particularly like this post as I have been searching for “home” for 11 years now. Thanks so much for the feedback. You are most welcome to explore with us as this unfolds! Marilu. god bless you and thank you for this. You are so dear and faithful. Thank you for your ministry of prayer and deep love in Christ.